I just saw the film. I was underwhelmed, and that's a rave review. I'll get to the science goofs in a sec, but first: I should have known....Clooney is "secretly" angling for retirement from his acting career, and he does this by carrying his characteristic clownish attitude into a "life or death" spacewalk scenario. There's even an ipecac moment in which he supposedly self-deprecatingly mentions his 'devastating' good looks. But all the generous helpings of corn could be stomached if it weren't for the added demention (new word) of pseudo-science. Forget inaccurate orbit angles.....the special effects go to great lengths to impress the natural lack of resistance to free motion in the "weightless" and airless environment of low earth orbit: uncontrolled spins, untethered drifting, momentary tether yanks, rocket propulsion techniques, etc. 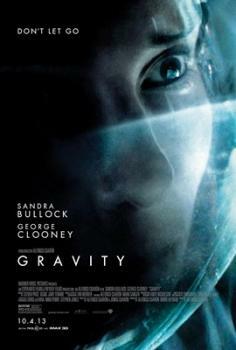 Then, suddenly, the special effects version of outer space gets all sentimental toward Clooney and instantaneously provides a sustained tugging force on the spacewalk tethers which forces a static Clooney to sacrifice himself for static space babe Bullock (cue tears beading and floating off otherwise dry cheeks). It's like Cliffhanger, only without the cliff. Simple, right? And then there's the curious substitution of a chain-reaction sequence of colliding satellites (not entirely impossible at a given orbit alitude) for conventional high explosives: we see not merely increasing entropy, but energy gains with every successive impact. Bottom line? Stuff kind of really tends to like, explode in, like, space. Y'know? aside from there being no good reason for G Clooney to float away from Bullock once they were unteathered .... wouldn't the space junk, travelling at a much higher velocity than the shuttlecraft/soyuz/heroes of the story, tend to settle into a much higher orbit than all that slower stuff? I can see it hitting them as the result of the initial explosion (though that's kinda unlikely), but I can't see it being in the same orbit the 2nd time around. As a physicist, I'm sorry, but I can't get over the blatant ignoring of some laws of physics while adhering fairly well to others. Specifically the number of times they slammed - hard - into satellites and debris floating around them. I can name several times within the first fifteen minutes where they would have died due to high speed collisions. Sorry, but no.